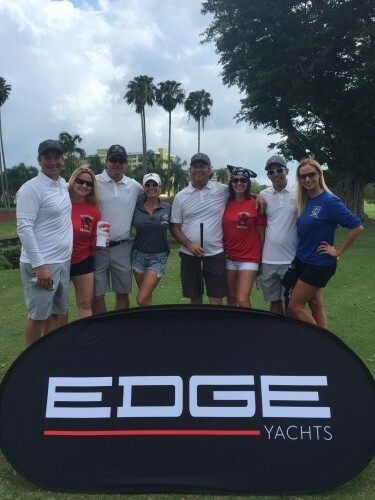 We sponsored one of the holes for the day’s activities, and made sure all the players felt the ‘Living on the Edge’ spirit with our temporary tattoos and Aerosmith-inspired bandanas. 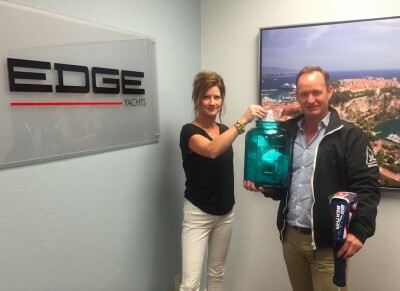 Congratulations to Captain Todd Lee of M/Y Sienna for winning our Big Bertha wedge on-course competition from last weekend.He was chosen at random by our very own Christina Compton, here accompanied by her lovely assistant Anthony Sands (Edge Yachts’ Founder and Director). Thanks to everyone who took part – as well as National Marine Suppliers – we hope you had as much fun as we did! We will see you out on the course again next year!